Voyenno-Vozdushnye Sily, Soviet Air Force used a fascinating variety of color shades during World War II combat – from early paints used until 1941, mid-war colours used from 1941 till 1943, to late war colors from 1943 till 1945. Due to extensive operations in winter zone, VVS was also a heavy user of various temporary winter-camo techniques. 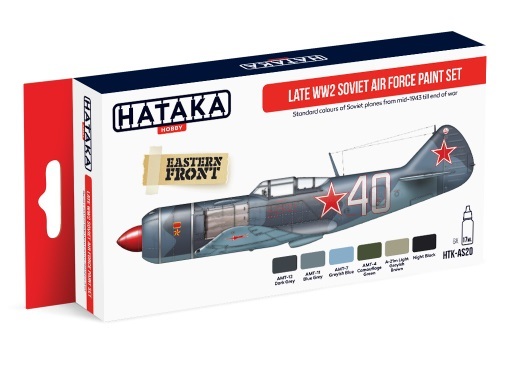 Hataka Hobby has proudly released first true colour paint set for VVS planes from their range – covering all major shades used by Soviet Air Force in the late WW2 period (from July 1943 onwards) on both fighter and attack aircraft.